Ferienwohnung-Städtler... Vacation with atmosphere in the "coloured town" in the Harz forest! Our holiday apartment offers approx. 45 m ² enough place for maximum 3 adult people and a child. In the bedroom with look to the castle the full third bed (adjustable upholsterer couch) exists beside a double bed. In from the bedroom about a small stair accessible top ground a mattress couch which is also used with pleasure by children is furthermore. Moreover, the bedroom disposes of SAT TV and DVD - player. The comfortable kitchen with eating place and look in the "Green" offers beside a cooker with oven, a smoke deduction, a fridge, coffeemaker, toaster, water cooker, dishes, cutlery and radio. In the comfortable sitting room you find two leather sofas, a couch table and SAT TV. The bath is equipped with WC, hose-watertight shower cabin, reflecting cupboard and hairdrier. 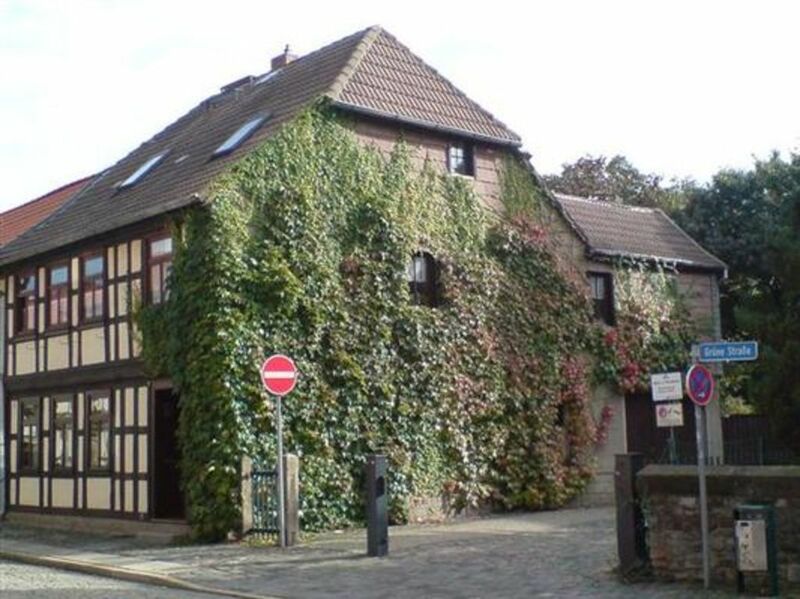 The holiday apartment is in the 2nd floor of a renovated, for the city centre of Wernigerode of typical historical half-timbered house. It was redeveloped extravagantly and furnished affectionately, so that the stay becomes in her a pleasant experience. From the holiday apartment you look in the direction of the east to the south, so from the palm house in the pleasure garden about in the mountains of the resin romantically embedded castle up to the "neighbouring house", the church Saint Johannis, the oldest church of Wernigerode. At just 10 minutes you reach the street Breite Strasse, the also architecturally interesting shopping mile and stroll mile from Wernigerode. At approx. 15 minutes you can reach from the holiday apartment the wonderful 500 year-old city hall, the interesting marketplace or the restful wood. Please note that the holiday apartment is not suitable for the disabled. Washing machines and dryers use: per object and day Costs amounting to 3.5 EUR (optional). Visitor's tax: per person and day Costs amounting to 2.8 EUR (optional). Wir haben selten ein so gemütliches und heimliches Ambiente wie in diesem Apartment vorgefunden. Dazu eine wirklich ansprechende und durchdachte Ausstattung, man fühlt sich sofort gut aufgehoben. Wir waren zu Dritt und haben einen wirklich schönen Urlaub genossen. In der Umgebung des Objektes ( Altstadt) ist eine Versorgung zu Fuß zu erreichen und man ist in 5 min in der Innenstadt. Wir werden wiederkommen. Sehr gute Lage! Alles war sehr gut! Parking facilities (per property and day, included in price 0 EUR). Visitor's tax (per person and day, to be done by tenant 2.5 EUR). Washing machines and dryers use (per property and day, included in price 3.5 EUR).